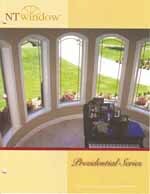 When it comes to windows, we give a great selection and variety. Just read about the featured windows listed below. Fully Fusion-welded, multi-hollow vinyl sash and frame. Double weatherstripping around the perimeter of the sash, at the sill and the meeting rails for maximum control of air infiltration, even during extreme cold when most weatherstrippings fail. 3/4" insulated Solar Control LowE glass for maximum efficiency. Formulated to reject the suns heat and damaging rays. 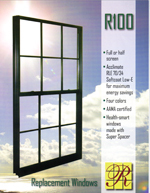 Worry-free lifetime warranty on all extruded vinyl components and insulated glass. Available in white, tan and special exterior colors. A classic wood window look in a vinyl window with it's integral brick mold and slope sill design. 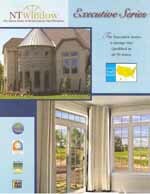 The integral J-channel and nailing fin makes window and siding installation a breeze. Designed with large multi hollows in the frame and sash with fully fusion welded corners; this window will stay strong and square providing many years of trouble-free operation. The accessory grooves allow mulling of individual units and custom shapes. Create that distinctive look and size to open up any room in the house. Limited lifetime warranty on all extruded vinyl components against blistering, corroding, flaking, peeling, and rotting. Full or Half screen available. Acclimate RLE 70/34 Softcoat Low-E for maximum energy savings. Health smart windows made with Super Spacer. Overall clean and simple use with ease to open while providing a reasonable amount of light for your home.